2 1/4 x 4 3/4 x 1 in. Object is a paperweight encapsulating 6 cylinders, each of which contains ferrite cores of decreasing diamteter. Diameters [in mils] are: 80, 50, 30, 22, 18, 14. 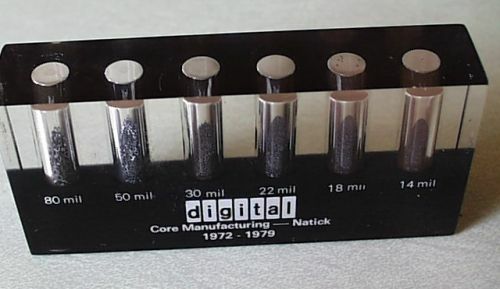 Text reads: "Digital Core Manufacturing -- Natick 1972 - 1979."